Exactly ten years after the U.S. military troops reaped the benefits from the Global Positioning System while fighting the Gulf War in featureless deserts, a new satellite was launched into orbit today to keep the constellation going. A Boeing Delta 2 rocket darted off its seaside launch pad 17A at Cape Canaveral Air Force Station in Florida at 2:55 a.m. EST (0755 GMT) to begin a 25-minute mission to deliver the NAVSTAR Global Positioning System 2R-7 spacecraft into Earth orbit. 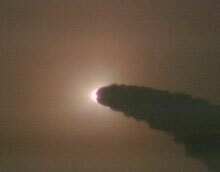 After a short countdown delay, the three-stage booster soared into the darkness of night to kick off Boeing's 2001 launch season in fine fashion. 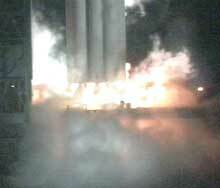 The nine strap-on solid rocket motors all fired and separated to give the Delta 2 extra thrust during the initial portion of flight. The first stage completed its job four-and-a-half minutes after liftoff and was jettisoned to fall into the Atlantic Ocean below. 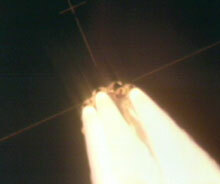 The second stage burned once to get the rocket into orbit by T+plus 11 minutes, then the vehicle coasted for about nine minutes before the stage's liquid-fueled engine was restarted to raise the altitude and increase the orbital inclination. The final boost was provided by solid-fueled third stage that propelled the U.S. Air Force's GPS 2R-7 satellite into the proper orbit. The satellite achieved a highly elliptical orbit that will be circularized and perfected by the craft's own propulsion in the coming two weeks. Air Force ground controllers are expecting the satellite to be "on station" by February 15 and ready to enter service a few days later. The $50 million satellite will join 28 other GPS craft working 10,900 miles above the planet to provide precision location, speed and timing information to American military forces around the globe. The system is also used by civilians and has grown into the commercial marketplace. Built by Lockheed Martin, this is the seventh in a series of 21 satellites in the so-called Block 2R generation that is keeping the GPS constellation functioning through this decade. The new GPS 2R-7 is destined to succeed an aging sister-satellite in the orbital position known as E4 in the constellation. Launched in November 1990, the GPS 2A-10 satellite has surpassed its seven-year design life and suffers from technical problems with its internal systems. Although still functioning, GPS 2A-10 will be shifted to a reserve role in slot E5. 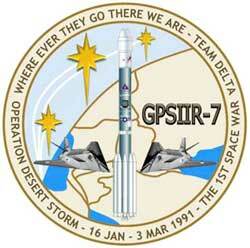 Started in the 1970s with developmental GPS 1 satellites, the operational system used today began with Delta 2 rocket launches in February 1989. This morning marked the 35th operational GPS satellite to fly and the 34th placed into orbit (one was lost in a 1997 launch failure). In addition, five satellites have been retired in space. GPS users on land, in the air or at sea obtain signals from the satellites as they pass overhead using special receivers. While the orbiting network was still being assembled with frequent launches, GPS was a vital tool for navigation by U.S. and coalition forces during Operation Desert Storm in 1991. Soldiers were able to go places and maneuver in sandstorms or at night while troops who lived there couldn't. About 9,000 receivers were brought to the Gulf region during the conflict and were employed by foot soldiers, helicopters, F-16 fighters, KC-135 aerial refuelers, B-2 bombers and Navy ships. The GPS system was declared fully functional in late 1993, and today is a fixture for the Department of Defense. Commercial users range from hikers to map makers to the transportation industry. There are 14 satellites left to be launched in this current GPS generation over the next several years. With one launch completed in this new year, Boeing has 10 more scheduled in 2001 -- all using the venerable Delta 2 rocket. The schedule remains fluid with several payloads currently shifting launch dates. But the manifest includes two more GPS missions, six launches for NASA, one mission for the U.S. National Reconnaissance Office and a commercial flight for Iridium. 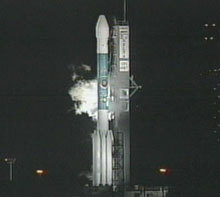 The Boeing Delta 2 rocket lifts off from pad 17A carrying the GPS 2R-7 satellite for the U.S. Air Force. Restricted zone - Map outlining the Launch Hazard Area where mariners should remain clear for the liftoff.